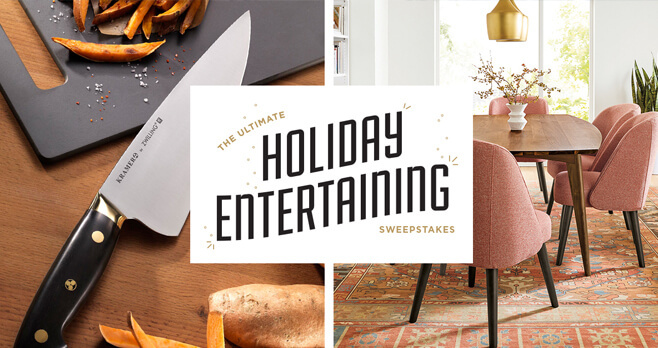 America’s Test Kitchen brings you the Ultimate Holiday Entertaining Sweepstakes. Enter by December 13 and you could win a $10,000 grand prize featuring a dining table and chairs, cookware, cutlery, specialty foods, online cooking courses, and $2,000. Who Can Enter? The America’s Test Kitchen Ultimate Holiday Entertaining Sweepstakes is open to legal residents of the United States and the District of Columbia, 21 years of age and older at the time the promotion begins. When To Enter? Sweepstakes runs from November 1, 2017 (12:01 AM EST) to December 13, 2017 (11:59 PM EST). What Are The Sweepstakes Prizes? The Grand Prize consists of $2,000 in cash and an Ultimate Holiday Entertaining Collection. Who Are The Winners? For a copy of the list of Winners, send a self?addressed, stamped envelope to: “America’s Test Kitchen Ultimate Holiday Entertaining Sweepstakes,” Winners List Requests, c/o America’s Test Kitchen, 21 Drydock Ave, Suite 210E, Boston, MA 02210. List of prize winners will be available from January 13, 2018 to July 13, 2018.